When we consider the boats of the Pacific islands, we tend to think only of multihulls: single and double outriggers, and double canoes. 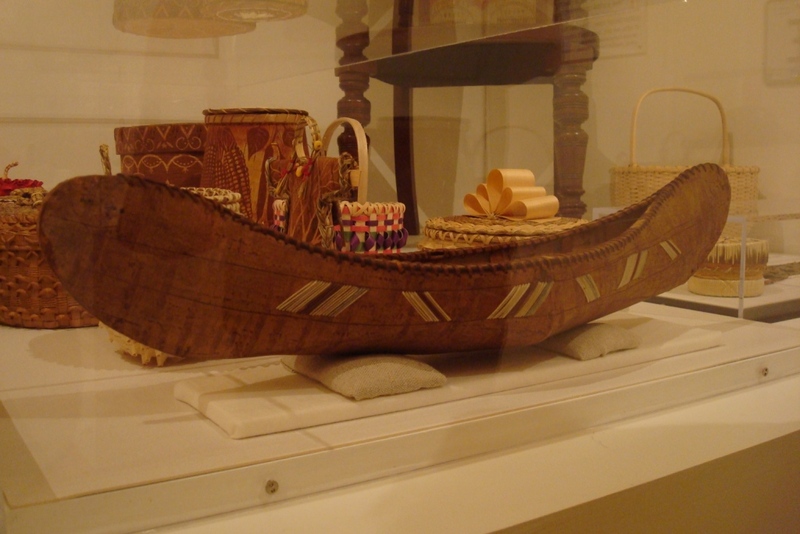 Small monohull dugouts were used throughout Polynesia for inshore work, but these were paddled, not sailed, and they rarely rise to the level of serious attention. 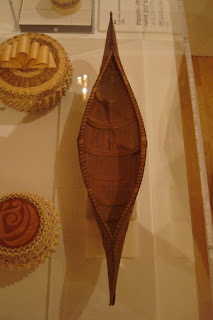 The Maoris of New Zealand, however, built impressive monohull war canoes up to about 100 feet long and 10 feet wide. They featured multiple thwarts, much decorative carving, a soaring decorative sternpiece, and lashed-on gunwale strakes. 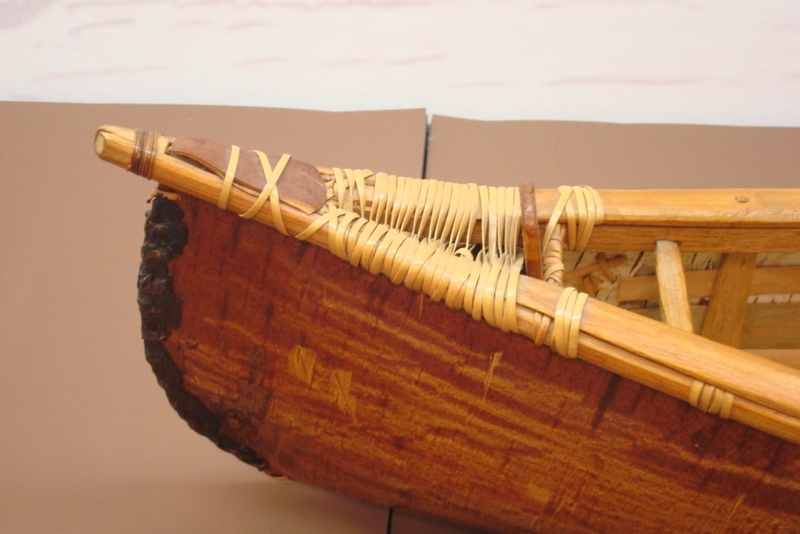 Occasionally the bow and stern were carved separately and lashed onto the open ends of the main hull, but more often, bow and stern were integral with the hull. Two to three years before launching, a suitable totari or kauri tree was identified and the brush around it cleared, indicating the builder's claim. (The Hawaiians also favored kauri, a species of very hard pine.) The tree might be quite far from the water (a distance of 30 km. 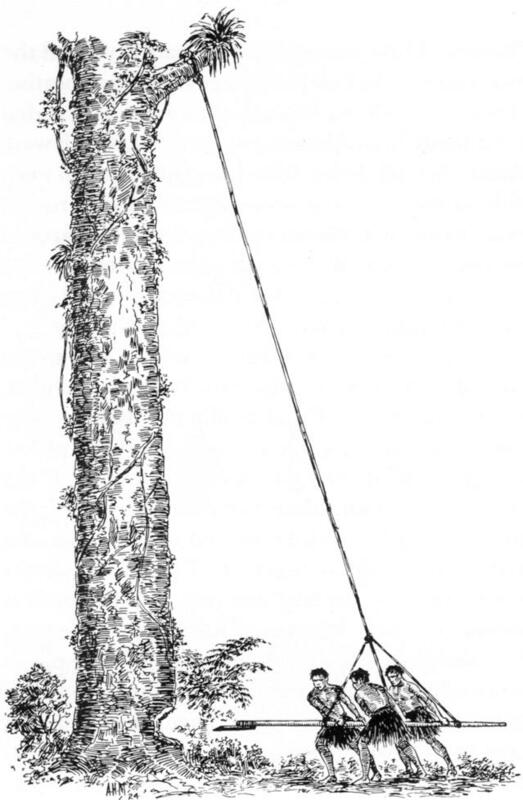 was recorded by in one instance), so a viable path for hauling was as important a consideration as the soundness and straightness of the tree itself. Bark was sometimes stripped off the trunk on the side that would later be hollowed, to promote decay and ease the wood-removal process. 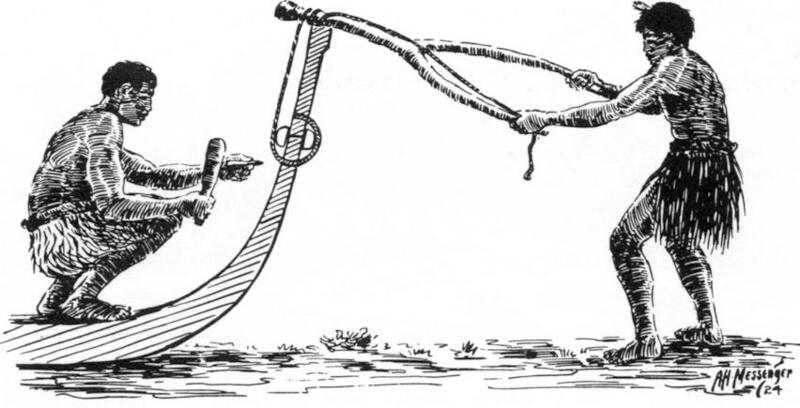 After some months, the trunk was felled by any of several expedients, including the clever battering-ram-style axe shown below. Turning the trunk over involved the use of levers, handspikes, parbuckles and Spanish windlasses. 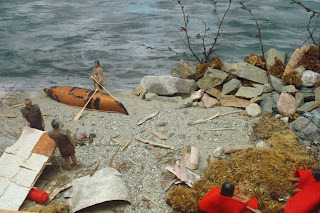 One method is shown here, but note that this trunk is about 6 feet wide at the most, while some Maori canoes were 9 or 10 feet wide, requiring both ingenuity and muscle to roll. 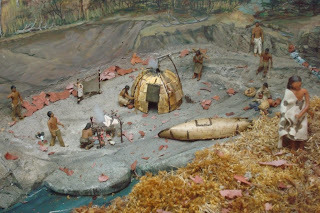 Once in position, the interior was hollowed by setting a series of small fires along the length of the trunk, then extinguishing them and chipping out the charred wood with stone adzes or, occasionally, shell tools. Little in the way of measuring or visual plans or guides were used at this point -- the canoe was shaped according to the eye and experience of an expert. Once roughed-out, the hull would be hauled to the shore. Skids were placed below the hull, and ropes attached fore and aft, two to four at each end. When proceeding down a steep slope, the ropes at one end would be snubbed fast around trees while the ropes at the other end were payed out gradually. When those ropes neared the end of their length, they would be snubbed fast and the ropes at the other end payed out, and so the process was repeated, always keeping the log under control. 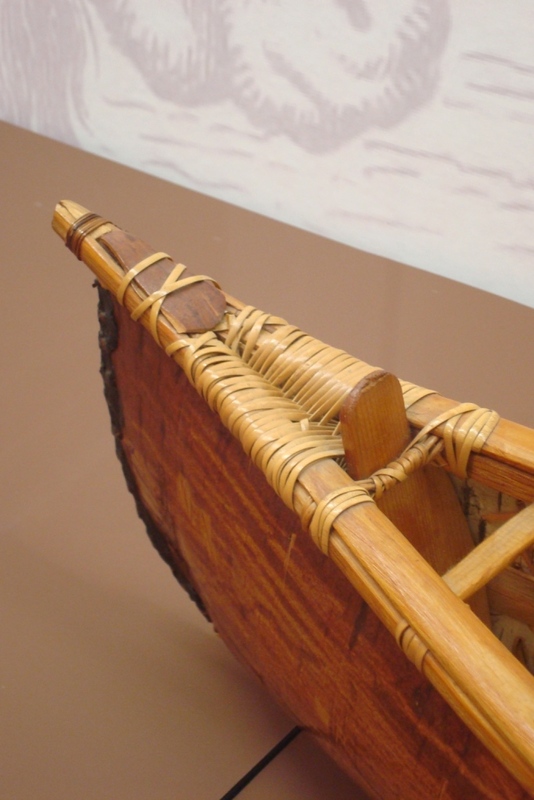 Once at the shore, posts were driven into the ground at the four corners of the hull, and taut lines tied between them parallel with the hull to establish visual guides and ensure that the exterior was hewn symmetrically. 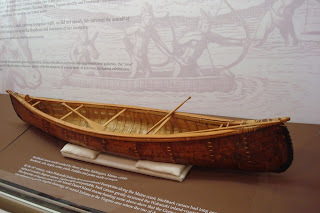 When separate bow and sternpieces were added, these fit onto the main hull "like a huge tenon and mortise" (Johnstone), and joined by lashings passed through holes made with a stone-pointed drill. Grooves were cut between the holes both inside and out, so that the lashings did not protrude past the surface of the wood. The interior was holystoned smooth. 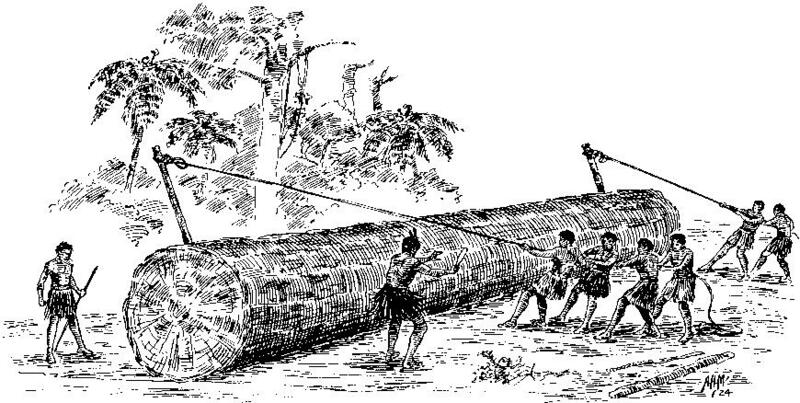 The topside or gunwale plank was gotten out by heating a log, then splitting it with wedges and hewing it with an adze. It was fitted to the top of the hull sides, and matching pairs of holes were bored in both edges. Half-round battens were placed over both sides of the seam, then these were bound in place, a great deal of leverage being used to draw the bindings tight and force the topside plank flush against the top edge of the main hull. Thwarts were sometimes shaped with shoulders on their underside to fit against the inside of the topside strakes. Sometimes the thwarts lacked shoulders and were instead set in mortises cut into the strakes, so that their top surface lay flush with the top of the strakes. In either case, they were lashed in place. Flooring consisted of three layers of fore-and-aft, transverse, and fore-and-aft members, providing a bilge several inches deep. 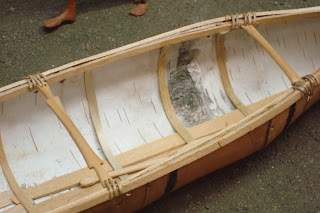 Parts of the canoe were left unfloored for ease of bailing. A hole was bored for draining the boat, and this was sealed with a wooden plug when under way. These boats may have been used by the first Maori settlers who arrived in New Zealand from Polynesia some time before 1100 AD. Although called war canoes, they may also have been used for long-distance travel and colonization. 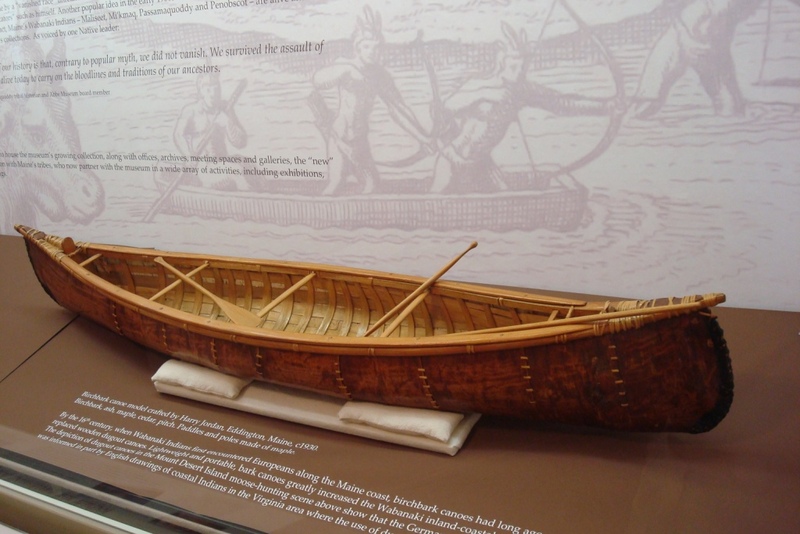 According to one early European observer, the Maoris "...in process of time, at an expense of labour, perseverance and ingenuity perfectly astounding in those who knew what it really was, produced...a masterpiece of art and an object of beauty, the war canoe capable of carrying a hundred men." The Indian god Glooskap. 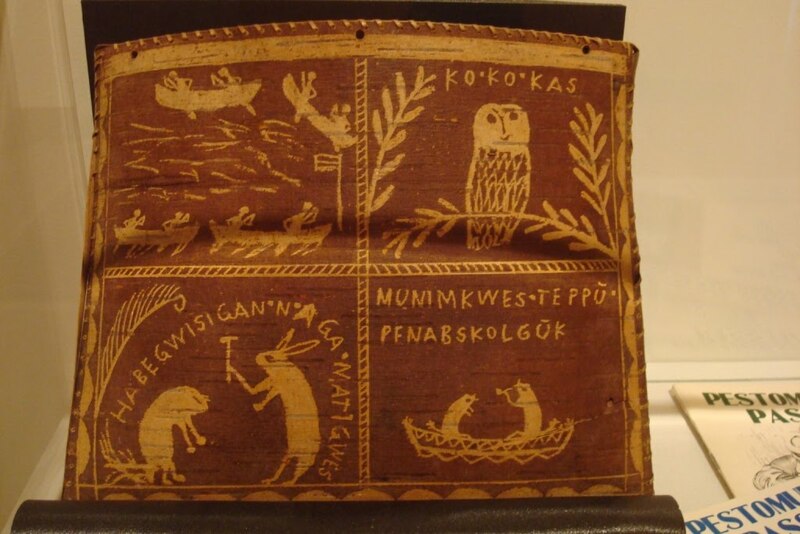 From display signage: "Is Glooskap still living? Yes, far away; no none knows where. Some say he sailed away in his stone canoe beyond the sea, to the east, but he will return in it one day." 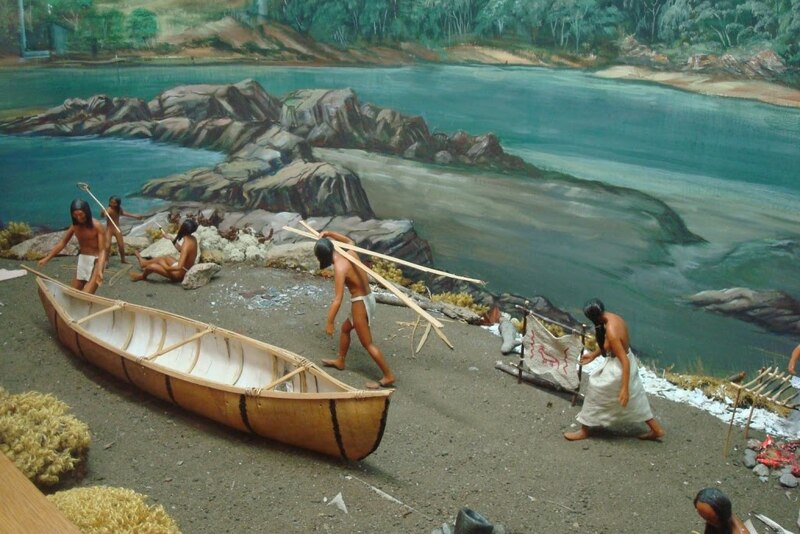 Another sign reads: "Glooskap built a stone canoe. He worked a year at it. 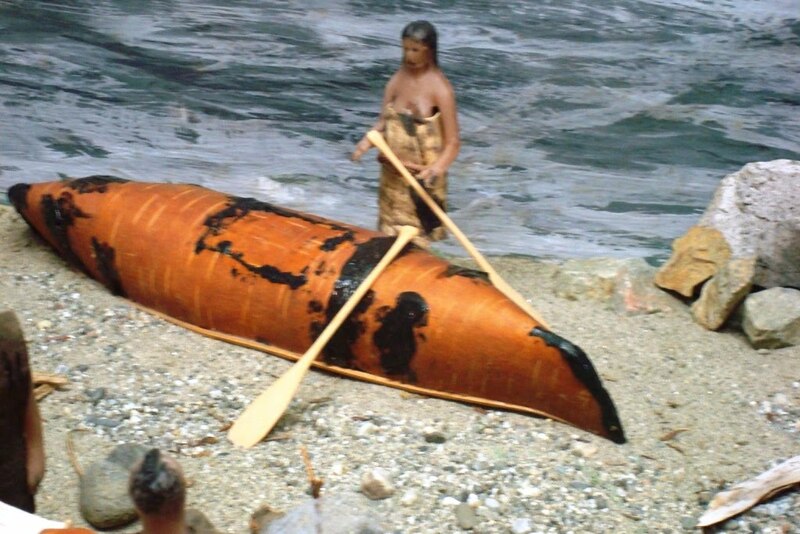 Then he dried meat and so provisioned the canoe with food and water. 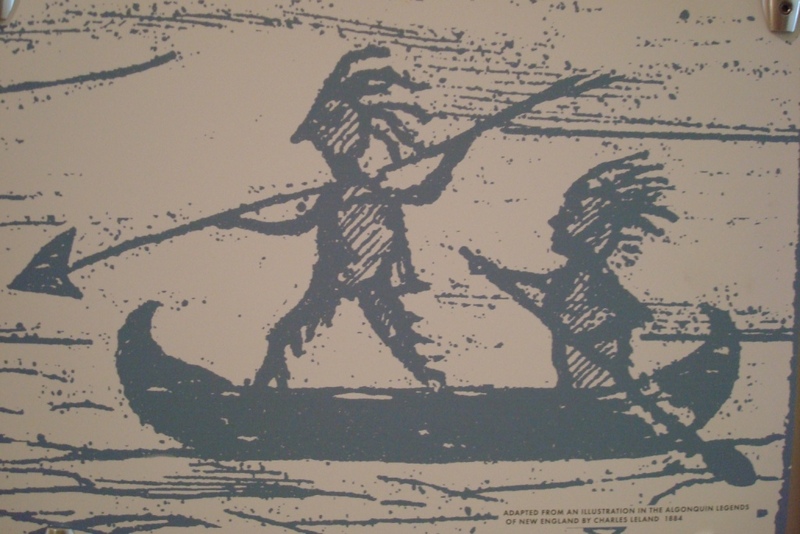 Along with his grandmother woodchuck, Glooskap sailed across the sea. This was before White people had ever heard of America. 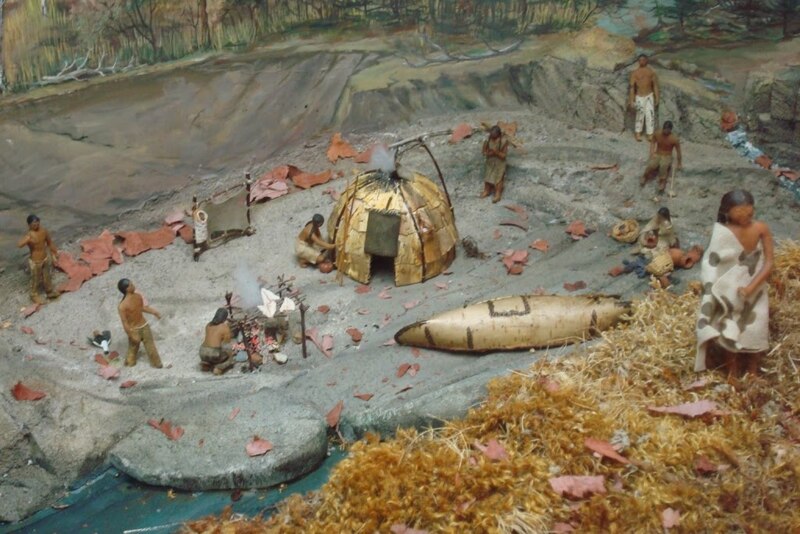 The White Men did not discover this country first at all. 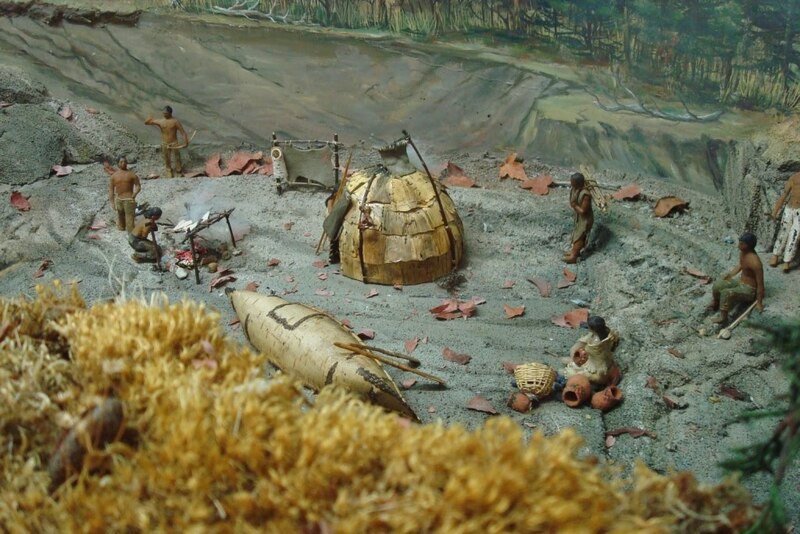 Glooskap discovered England, and told them about it." Mail pouch by Tomah Joseph, Passamaquoddy, 1890. Birch bark and ash. Upper left shows four canoes near a shoreline with a flagpole. Lower right shows a groundhog sitting in a stone boat. 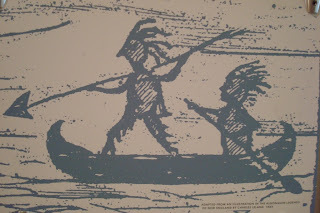 The the other figure in the boat is not identified. This picture and the next two: Model canoe, ca. 1900, probably Micmac. 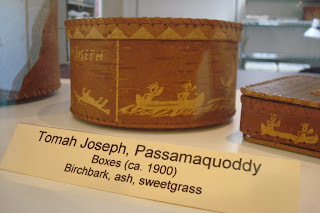 Birch bark, rattan, cedar, ash, porcupine quill decorations on side. 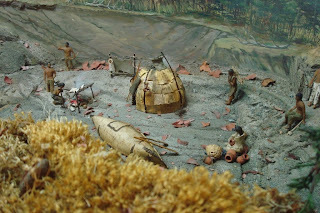 Models like this were built in large numbers by Mt. Desert natives as tourist souvenirs. 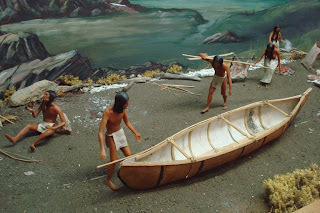 Accuracy was clearly not an objective in these models: they were meant to represent canoes in a general way for an undiscerning audience, and the decoration was probably more important than the canoe's shape or construction. It does look nice in plan view though. 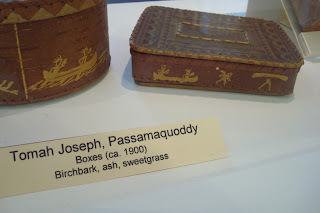 Colored quill decoration on the sides. Above and below: bark boxes showing canoe images, also typical tourist-trade goods. 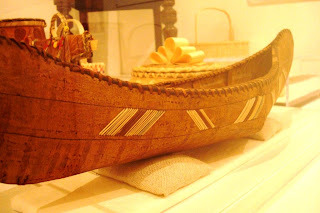 This photo and the two following: Large Wabanaki birchbark canoe model (probably about 28 inches LOA) by Harry Jordan, ca. 1930. 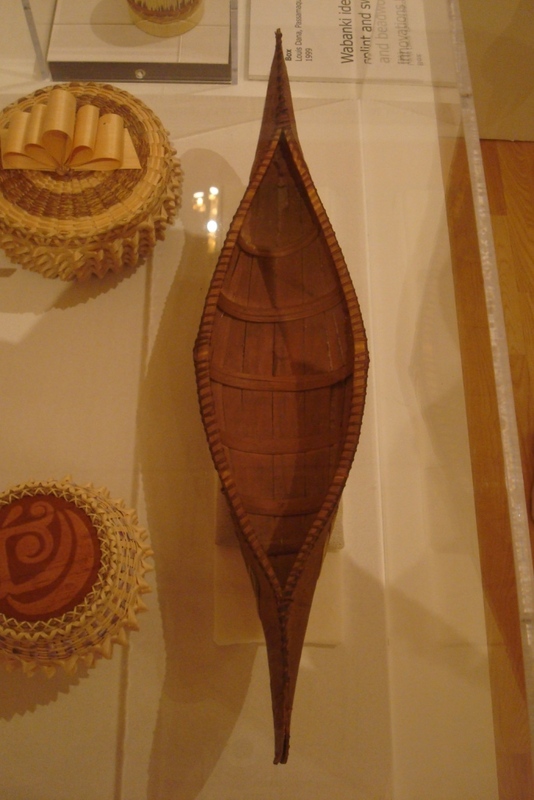 Birchbark, ash, maple, cedar, pitch. Paddles and poles of maple. Elaborate binding of the gunwales near the ends. I'm unfamiliar with the flap that's lashed atop the intersection of the gunwale ends -- it's not like the wulegessis, that folds under the gunwales and overlaps the top of the hull sides.. This view shows the headboard clearly, and the unusual way it's bound in place. Pulled up on a beach for repairs.